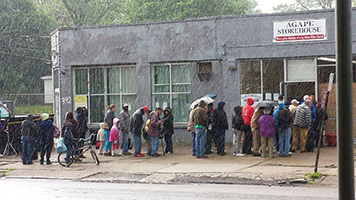 Women, men and young children came and went from the impromptu waiting room outside the WIC Clinic at Pinewood Gardens April 30th. Children played with a bead maze while their guardians filled out forms. The Special Supplemental Nutrition Program for Women, Infants and Children (WIC) provides services for pregnant women, recent mothers and children up to the age of five. These services include a food program, health care referrals and nutritional education. The clinic was formed three months ago, after AMHA realized community members were traveling to Akron for their WIC appointments, Morehouse said. Macedonia was closer, but it was not on the bus line. The need for food doesn’t end with the holidays and one Akron church is tackling that need daily, head on. Akron Bible Church, 783 Brown St., started delivering holiday food baskets in 1980 with a distribution of 12 baskets. Now that ministry has grown to thousands of baskets delivered all year. “In 2009 our pastor had a vision of a year-round ministry of providing food,” said Henri Etta Fletch-Lockhart who with her husband, Rev. Larry Lockhart, directs the ministry. She and her husband are the primary volunteers.